Our club winners of the ‘Club Education Through Sharing Rockhounds of the Year’ award from the CFMS. Cady Mountain Agate pendant crafted by member Terry Vasseur. We have experts in our club specializing in fossil preparation, fused glass, opal cutting, lapidary and beads, cuttle bone casting, silver fabrication, tumbling, inlay, Zeolite minerals, lost wax casting, Suiseki (stone appreciation), workshop design and construction, sphere making, and silver fabrication. Monthly Meetings: Meetings are scheduled on the First Tuesday of the month, 6:30 p.m., in the meeting room of the Torrance Public Library, 3301, Torrance Blvd.. Visitors and guests are always welcomed at all club events. Our meetings include an educational presentation by a guest speaker or in house expert, refreshments, fellowship, show and tell, and a raffle drawing. Presentation by Mr. Francis Lou, pearl expert. ‘behind the scenes’ tour at the Los Angeles Natural History Museum. 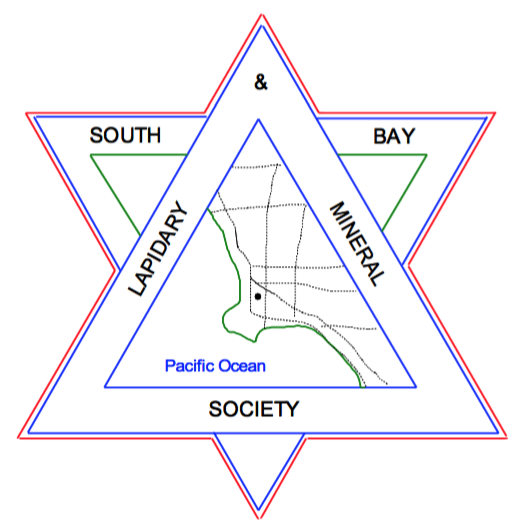 Club members are also invited to attend regularly scheduled field trips that take place within driving distance of the South Bay. Field trips include rockhounding, visiting other rock shows and lapidary venues, museum trips, and our annual trips to Stoddard Wells and Quartzite!